Over the last few decades, Nike has released so many different shoes that sometimes it's hard to keep up with. The Beaverton brand could go deep into their vault and bring back any shoe they want and at least someone would be excited. Even if we look back on a shoe now and think, "maybe that wasn't so good," Nike will still have us feeling those waves of nostalgia. So much so that they may even trick us into buying something we used to think was wack. Well, it looks like Nike is looking to take full advantage of that fact as they're bringing back the Nike Shox 4 to the masses. 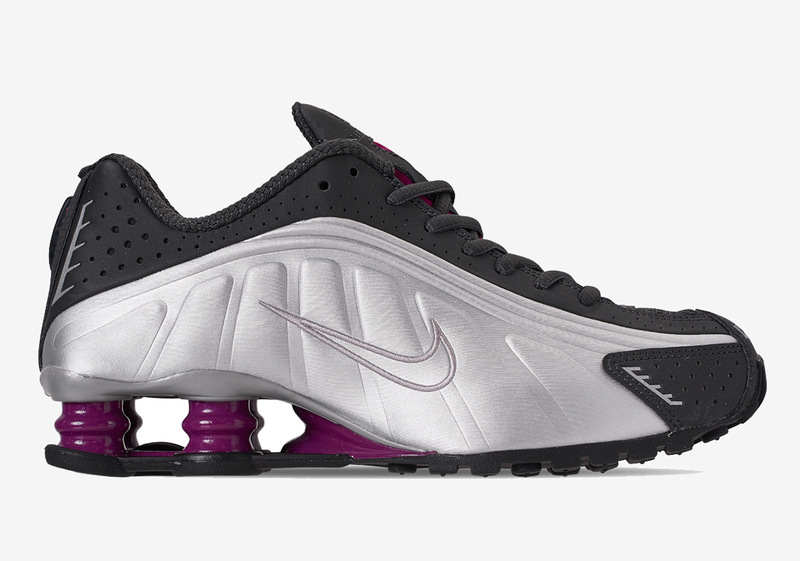 While Nike's Shox technology may have been considered a relic of the past, its aesthetic is still captivating despite its obvious cosmetic flaws. Nike has revealed a few colorways of the shoe so far, one of which being this brand new "True Berry" model. The upper is divided into two, with the top half featuring anthracite suede, all while the bottom half gets dressed in metallic silver. The purple "True Berry" coloring can be found on the Shox unit in the back. According to Sneaker News, these will be released at retailers like Finish Line on April 13th for $160 USD.